Not my scan, stolen from Kasumi Monogatari. This is from a pencilboard, this picture was also the cover design for manga volume 7. Yuuko is sooo cool! I loved her shoe! So cool! Watanuki is looking a bit strange but very charming... Thanks! 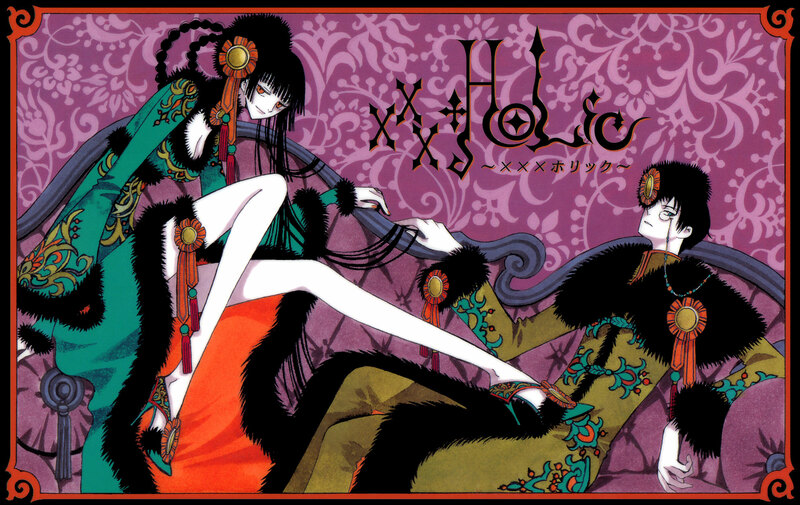 This post is a good sign that soon I'll be able to read more xxxHOLIC at BWY! aw this is wonderful! I love xxxholic - so more pictures the merrier! Hohoho... Yuuko is bullying Watanuki as usual. Great title - they definately look like a pair of scandalous aristocrats! ^_^ fave! Wow this is a wonderful scan! I love how clear yours are! You know, Watanuki looks a whole lot like Clow Reed here, but I love Yuuko's shoes! Thanks for this ever marvelous scan! You are the queen of xxxholic scans! I first saw this image on one of the covers of the Tokyopop editions, and I'd have to say that that beautiful green gown is my favourite of Yuko's outfits. Greatest legs ever... i think. the wallpaper in my room is exactly (well, almost)like it!